This spring has seen a substantial uptick in the number of emails I get from students who’ve been assigned by their teachers to interview someone who has a job they think they might want. “Game designer” seems relatively popular. Most students follow what I assume is a standard template issued by the Platonic Teacher of Career Inquiry: “What kind of education do you need to be a game designer?” “How many hours do you have to work?” “What skills do you need?” These are fine questions, if unimaginative. Until very recently, when the volume became Simply Too Much, I always answered them. The week before last, I launched a Kickstarter for something called The White Box. It’s a game design workshop-in-a-box. It has a book of essays about game design in it, along with a boatload of generic components that can help with early prototyping. As I keep writing in tweets, posts, and emails, The White Box is all about getting the game design out of your head and onto the table. To be clear, I’m the publisher and producer of The White Box, not its author. Jeremy Holcomb is its creator, and it’s being released with the cooperation of my friends and colleagues at Gameplaywright and Atlas Games. 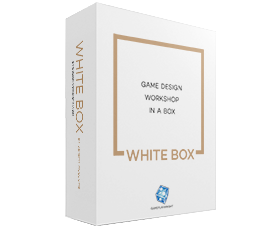 As much as you don’t need anything at all to sit down and start designing a game right now, if you think game design is, or sounds, awesome, The White Box could be just the thing to help you overcome the grim force of inertia and start designing. If you’re reading this before May 17, 2017, have a look at our Kickstarter. If it’s after that, don’t fret. Our partnership with Atlas Games will keep The White Box in distribution for years and years to come, so look for it in your Friendly Local Game Store. I think designing games is awesome. If you think so, too, check out The White Box.